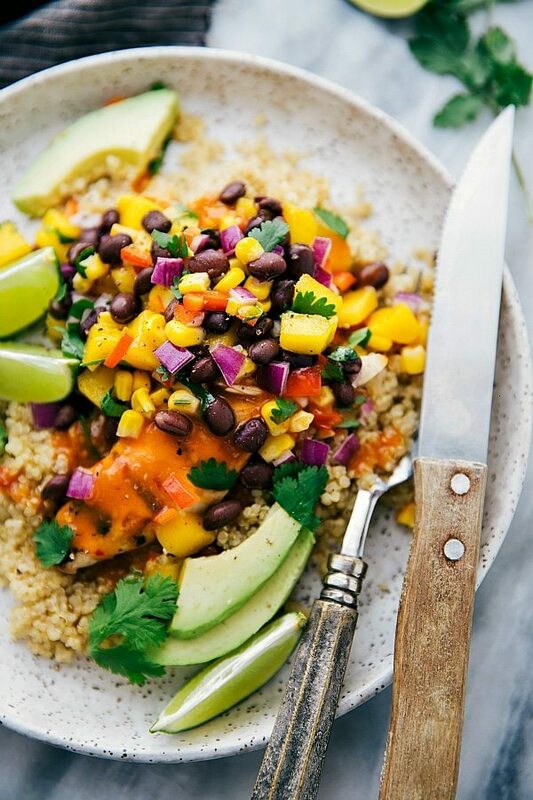 A bed of quinoa with marinated and grilled chicken breast topped with a fresh and healthy mango salsa. So my husband and I both graduated college together. In fact we got to walk together which was a really fun experience. The funny thing is, the husband keeps getting emails from a high school English class. These emails range from homework assignments to extra credit opportunities to grade updates. Apparently someone missed the memo that not only did he graduate high school, he also completed two degrees at college. At first, the husband was worried someone was missing out on these emails and he was being mistaken for a student in the class. He sent email after email that he was not registered for the class. He even spammed the emails after continuing to receive them. But they keep coming. And the teacher is convinced he is indeed in the class. Regardless of all that he says otherwise to her. We recently decided that if this winter does not in fact turn to Spring and continues to limit our weekend activities, that perhaps doing a few extra credit assignments wouldn’t hurt. You know, maybe we could still learn a thing or two and can pretend we didn’t in fact graduate. Like the good old times – sitting on the couch doing homework together. Except for the fact that I wouldn’t necessarily consider those the good old times… Homework was rarely considered a fun activity in my mind. Important, yes? Fun, no – not really. But the more we’ve discussed it, the funnier it gets – the idea of doing one of the assignments and submitting it. Don’t worry, I’ll keep you updated on our grades in 11th grade English. Wish us luck! Anyways, these are pretty simple to put together. I marinated the chicken in a simple marinade overnight. Then the chicken gets grilled while the quinoa cooks. 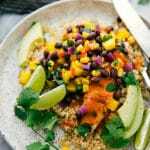 The mango salsa is a simple chopping up and adding ingredients together. 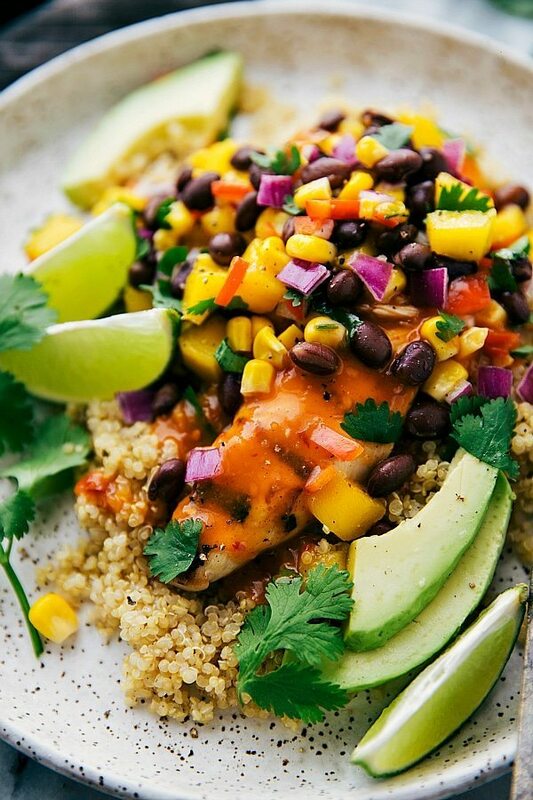 Putting it together – the quinoa goes first, next the chicken, and finally, the mango salsa to top it all off! Remove from the marinade, pound to an even thickness, and then grill until completely cooked through. Meanwhile rinse and then cook the quinoa according to package directions. For the mango salsa, prepare all of the ingredients by draining, rinsing, and chopping them as explained in the ingredient list. Stir all the ingredients together. Cover and allow to sit in the fridge and marinate for 20-30 minutes. Prepare four plates by placing one cup of quinoa on each plate. Top with 1/2 cooked chicken breast. Divide the salsa evenly among the four plates. Optionally garnish with cilantro and sliced avocado. Squeeze a wedge of fresh lime over the dish. *We tried Nando's peri-peri sauce while living in Australia and it is honestly the best sauce I've ever had (it's pretty famous there). We brush it on the last bit of grilling and then pour some on top of the grilled chicken and it is UNREAL with this salsa. Highly, highly recommended! (It's extremely spicy, so stick with mild if you are worried about spice!) Here's a link if you want to check it out online! And this bowl? Looks amazing. The marinade sounds so interesting and all the flavors in the salsa sound perfect. Can’t wait to try this! This looks so fresh and healthy! I love mango salsa. And how crazy are those emails? That’s so odd! I’m loving this colourful salad bowl. Is there a particular reason for using sprite in the marinade? Thanks Rochelle! So I used soda in the marinade because the citric acid in the soda really tenderizes the meat! I usually use soda in all my meat marinades and love the results! What a funny story! That is my husband’s reoccurring nightmare though. He dreams that they take away his college degree because he forgot to go something in high school. Sprite in the marinade, how fun! Mexican flavored foods are my family’s favorite. Yum! Me and my mom love getting bowls like this! The mixture in this bowl looks so delicious. Chicken, quinoa, avocado, and mangoes are some of my absolute favorite foods. Must try! Oh yum! I love mangoes in pretty much anything and this salsa has my name written all over it!! This would be one delicious lunch or dinner… can’t wait to make it. This looks AMAZING! I made a mango salsa last night with goat cheese and it was fabulous so I am obsessed now. Going to Pin this one to try. Thanks for the great recipe and good luck in English! These look gorgeous, delicious and healthy! I actually have all these ingredients at home, so guess what’s for dinner tomorrow. Good luck with your homework assignments. Submitting something to the teacher ought to really confuse her. Have fun! Haha we are hoping so! Thank you Lisa! 🙂 I hope you enjoy this meal! Haha – that is too funny! Why won’t they stop emailing him?! I am loving these quinoa bowls! Mangoes were on sale at Whole Foods the other day, so I have like 6 in my fridge. Definitely going to whip this up for dinner!! That’s hilarious! What’s he have to do, email his degrees and divers license to this teacher? Ha! Loving everything about these bowls, especially the mango! Love everything about these quinoa bowls! So fresh and flavorful! This looks so delicious. Perfect for Spring that really isn’t here yet. It’s snowing here. 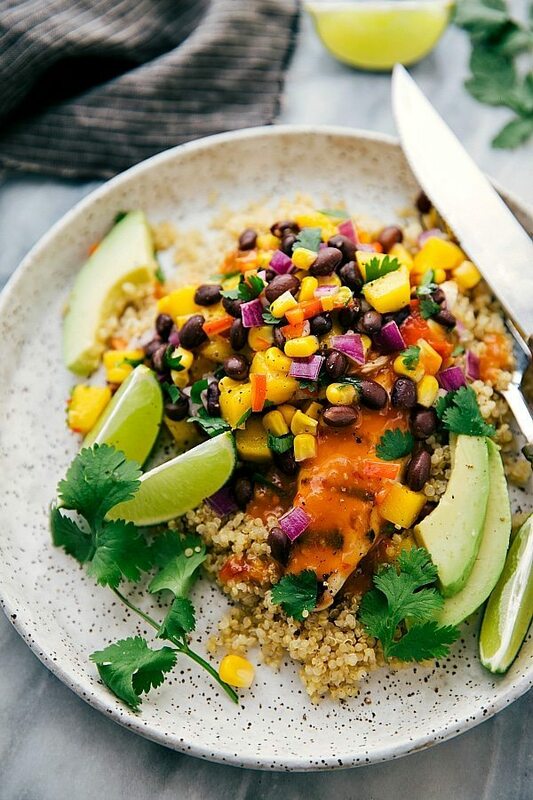 Haha, too funny on the e-mails – good luck with the extra credit 🙂 These pretty quinoa bowls would surely get you an awesome grade – I love anything with mango 🙂 Everything looks so fresh and colorful – yum! It’s been a little while since I’ve had mango salsa. Now I’m craving it again. These look like the perfect meal in a bowl. Pinning! How funny, I hope you guys get some extra credit! This chicken bowls look awesome! I think the mango salsa may be my favorite part. I love dinners like this! Haha hoping we do 😉 Thanks so much Danae! Bowls like this are my favorite! I love how you can get a little bit of everything in one bite. This looks delicious! This looks amazing! I would love to try a bowl of this. 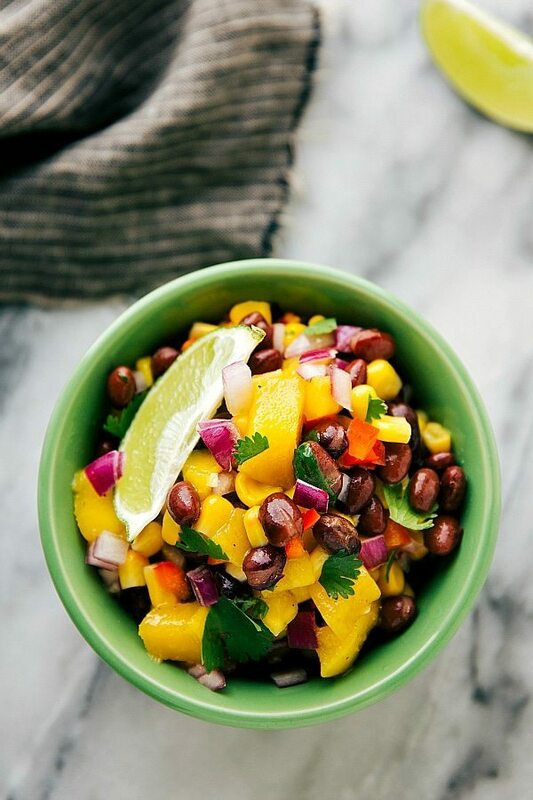 Mango salsa would definitely complete this bowl. Haha definitely would be fun to see! Thanks so much Lisa! 🙂 hope you’ve had a wonderful weekend! Hi!! 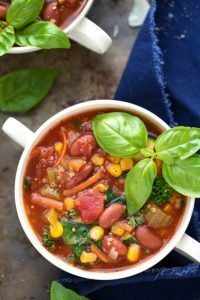 I ran across this on Healthy Eating Planner and it looks wonderful!! 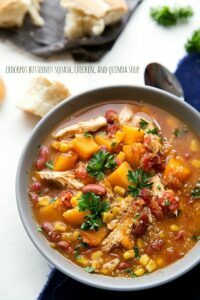 I love the idea of the salsa and have always wanted to make one, however, I am not a fan of mango. What else would you recommend in place of it? Pineapple? Thank you Darlene! Pineapple would make a fantastic substitute! I made this for dinner earlier this week, and it became an instant favorite with my family. The flavor of the chicken was amazing, and the salsa was fresh and delicious. We loved it so much, we are having again tonight! Thanks for sharing this fantastic recipe!